The TIFR Nationwide Entrance Examination (GS-2019) for Biology is also called the Joint Graduate Entrance Examination for Biology and Interdisciplinary Life Sciences (JGEEBILS). See http://www.ncbs.res.in/JGEEBILS. All participating JGEEBILS institutions use the score from this examination, but each institution has its own admission procedure. Students need to apply separately to each institution that uses the JGEEBILS score. The primary route by which TIFR Centres (DBS-Mumbai/NCBS-Bangalore/TIFR-Hyderabad) receive applications for the Graduate Programme in Biology is via the TIFR/JGEEBILS exam. Candidates will be shortlisted for on-campus interviews based on exam marks, CV, scientific write-up, and letters of recommendation. Each TIFR Centre shortlists candidates independently. All GATE/CSIR applications are now closed for this year. (1) You are in the top 10 percentile of ranks (e.g. you must have a rank of 200 or better if a total of 2000 candidates appeared for the corresponding exam). In the full application you will be required to state your GATE/CSIR/UGC-NET rank and upload the corresponding Score Card as supporting evidence. (2) You have at least one year of research experience under a single supervisor at the time of submission of this application. This research supervisor must be included as one of your referees at the time of submission of the full application. If both the above apply to your case, please write to phd@ncbs.res.in. We will provide instructions to you on how to submit a full application. DBS: Feb/Mar 2019. NCBS: May/Jun 2019. TIFR-H: May/Jun 2019. For Ph.D.: Masters in Basic Science (M.Sc. Physics/Chemistry/Any branch of Biology) or any professional Master's Degree (M.Pharma./M.Tech. ), or a > 4 year degree program (e.g. MBBS, BDS). For I-Ph.D./M.Sc. : Bachelors in any Basic Science (Physics/Chemistry/Any branch of Biology) OR any 4-year degree program that awards a "Bachelor's degree" including B.Tech., B.E., B.V.Sc., B.Pharma. (4 year course). M.Sc. Wildlife Biology & Conservation: No admissions this year. 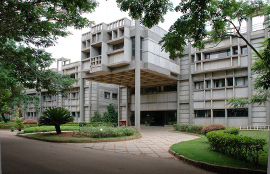 Department of Biological Sciences, TIFR, Mumbai (http://www.tifr.res.in/~dbs).